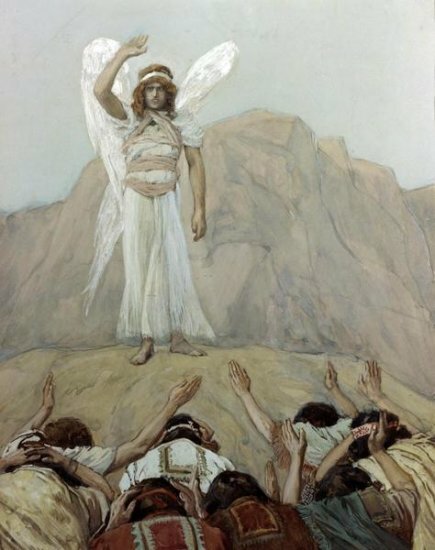 Heart of Story: At Bokim the angel reprimanded Israel for not obeying God and killing Canaanites. Back Story: The Israelites entered the Promised Land and Joshua divided the land among the 12 tribes. God told the Israelites that when they conquered the land (villages, towns, cities) all Canaanites must be killed. Bokim was located near the town of Bethel (formerly called Luz). The tribes of Joseph (Manasseh and Ephraim) attack Bethel and killed its citizens. Neither Manasseh nor Ephraim killed other Canaanites who lived in land allocated to them. Nor did the other 10 tribes destroy citizens in lands they captured, despite God specifically telling them that all Canaanites must be killed. When the angel of the LORD had spoken these things to all the Israelites, the people wept aloud, and they called that place Bokim. There they offered sacrifices to the LORD. After Joshua had dismissed the Israelites, they went to take possession of the land, each to their own inheritance. Pondering Relationships: Bokim in the Hebrew language means crying or weeping. At Bokim the Israelite tribes gathered and there they were reprimanded by God’s angel because they did not follow his instructions. I’m never quite sure when I read Judges why the Israelites refused to follow God command to destroy the Canaanites. Perhaps, they believed that they were strong enough to stand against Canaanite idolatry. Perhaps they were this strong. Judges 2.7 noted that this generation of Israelites served the Lord throughout the time of Joshua and when the elders continued to live. Although the first generation to enter the Promised Land had the strength to adhere to God worship; however, subsequent generations did not. In three generations, Israelites were worshiping the gods of Canaan. After the angel reprimanded the Israelite elders at Bokim, elders wept in grief that they rejected this most basic of of God’s commandments. The first generation Israelites people disobeyed God and drifted into spiritual decadence thinking they could overcome any outside temptation on their own. They were wrong. This early in Israelite history, elders set the stage for fall of Israel (Northern Kingdom) and the Babylonian exile by refusing to follow the command from God to “have no other gods before me.” They thought that they had more knowledge than God had. They thought that they had strength to resist idol worship. Reflection: Are we able to resist the temptations coming to us from every direction without God’s strength? No, of course not. We are no better than the ancient Israelites. When you fall to sin (and you will) turn to God for help. Admit sins to Him, ask forgiveness, and then let God help us to turn away from the sin. This entry was posted in Angels, Jacob's Offspring and tagged Angel, Bible Study, Bokim, Disobedience, Lesser Known Bible Characters, Obscure Characters, Obscure Characters in the Bible. Bookmark the permalink.